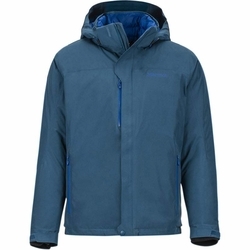 Marmot Synergy Featherless Jacket. The waterproof Men's Synergy Featherless Jacket is made for tackling epic slopes and tough treks in unpredictable, cold weather. The GORE-TEX fabric and PFC-free, water-repellent finish will keep you dry and comfortable even when you wear this insulated jacket over a base layer. The 3M Thinsulate Recycled Featherless Insulation is made with 75% recycled loose-fill fibers that feel just as warm as 700 fill power down, but still perform when wet.